Images: Mermaid by company unknown. Birds by Magenta. Ledge 054F, Tall Peak 182G, Brook Falls 184G, Pines & Rocks 195G, Cloud (Cumulus) 018E, Cloud w/Moon Lg 106G, Solo Canoeist 159A by Stampscapes®. Note: Another great piece by Danielle in her mermaid series. Depth is emphasized in this piece by her usage of value from front to back. Rocks in the foreground are darker and more intense than the background images pushing space. 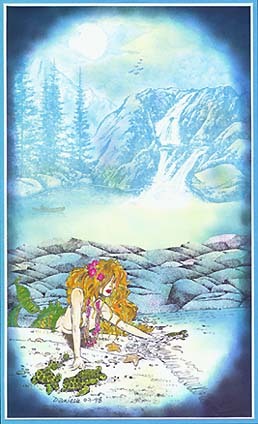 The three fields of light are separated and defined by two darker regions in the ledge behind the mermaid and the falls and tree figures underneath the lighter moon area. The dark border frames and contains the overall composition.